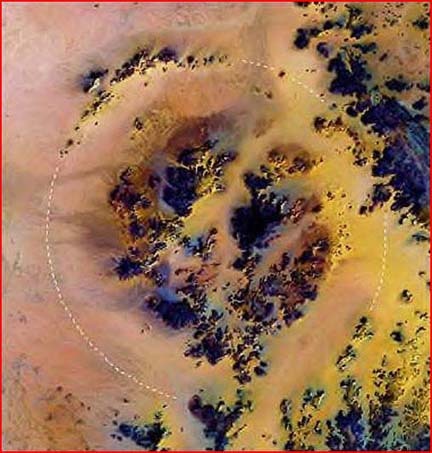 A huge crater in the Sahara desert, said to be the largest one ever found in the region, and dwarfing Arizona's "Meteor Crater", poses new questions for geologists. Is the crater related to the origins of the mysterious "desert glass" in the region? Scientists suggest that a meteorite impact millions of years ago is the cause of the giant crater imaged above. Recently discovered in satellite images of the area, the crater lies in Egypt's western desert. It is some 19 miles (31kilometers) wide and is said to be the impact site of a meteoric intruder perhaps three-fourths of a mile (1.2 kilometers) in diameter. The crater itself is more than 25 times the size of Arizona's famous Meteor Crater. But over time, erosion by wind and water largely obscured the ancient scar. One intriguing aspect of the discovery is its close association with a mysterious field of yellow-green glass, broken into large chunks, littering the dunes in the Great Sand Sea of southwestern Egypt. The first report of the yellow-green “desert glass” came from Patrick Clayton in 1932, following his excursion through the Saad Plateau near the Kebira Crater site. At the time, the origin of the glass was unknown: There was no evidence of geological forces that could have melted the silica sand into glass. With Kebira’s discovery, a hypothetical source for the glass is now available. Geologists speculate that the glass originated as ejecta from the Kebira impact. It is thought that the meteor strike imparted so much energy to the surrounding silica sand that it was melted and then explosively hurled outward, solidifying and fracturing into shards, as depicted here. Although the glass is most likely a result of Kebira, the method by which it was created is open to question. 1. The glass is too pure – some of the purest natural silica glass ever found. If the glass shards are tektites (melted slag from volcanoes or meteor impacts), they should include the presence of other minerals. 2. The glass does exhibit small internal bubbles that include other elements. One of those elements is iridium, the presence of which indicates an extra-terrestrial origin, according to prevailing theories (see Alvarez, Luis W., et al. "Extraterrestrial Cause for the Cretaceous-Tertiary Extinction: Experimental Results and Theoretical Interpretation." Science 208 (1980) 1095-1108). However, the glass reveals no evidence of other minerals found in the region, such as halite and alumina. 3. Another area where this type of glass may be found is atomic test sites. If the explosion of a solid object, like a meteor, did not form the glass, then there remains one other method available—an enormous electrical discharge. The glass shards, then, are the remains of large fulgurites. Fulgurites are created when bolts of lightning strike refractory minerals in the earth, instantaneously smelting the minerals into other forms, such as cristobalite. The yellow-green glass does, in fact, contain cristobalite inclusions, along with the iridium and other platinum family elements. If one grants the power of a lightning bolt large enough to form an impact site some 19 miles in diameter, then additional possibilities must also be considered. Electrical theorists have long claimed that highly energetic electric discharge transmutes elements—a process that is going on all the time on the surface of stars, they contend. The same thing is implied on Jupiter's moon Io, where electric discharge appears to be continuously transmuting oxygen from water ice into sulfur. (The association of energetic lightning strikes with a "sulfurous stench" is much more than an old wives' tale, the electrical theorists say). 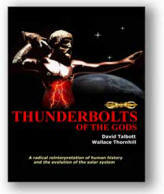 Is the Kebira site the scar of a cosmic thunderbolt? If so, new directions of investigation will be essential.